David, God bless you in your debate. Will you be back in time for Pamela's talk on Wednesday? Do you plan on attending it? Yes, I'll be at Pamela's talk. See you there! Former Atheist debating a former Christian. Vice versa. I pray Brother David with the help of the Holy Spirit win John Loftus back to Christ. Interesting! 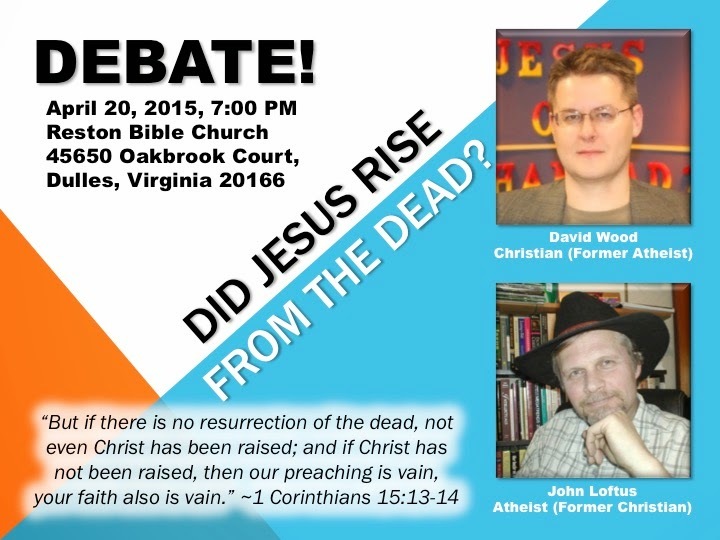 I want to see this... Is this debate going to be posted online? It is easy to be an Atheist, but it is difficult to be a Christian, David Wood knows it very well. What John Loftus rejected Jesus Christ as corner stone to build his spiritual home, David Wood picked up the same to build his spiritual home from ground zero. Jesus’ resurrection is new chapter of human life story; those who accepted Him by faith experience His presence daily. May God bless David! Mr. Wood, will it the debate be live online? Mr. Wood, was the event recorded?